The couch where everything and anything begins. Left to right: Homer, Santa's Little Helper, Marge, Lisa, Snowball II, Maggie, Bart. "D'oh!" note Or "[annoyed grunt]" to the scriptwriters. The brainchild of independent cartoonist Matt Groening, author of Life in Hell, The Simpsons first aired from 1987 to 1989 as a series of animated shorts on The Tracey Ullman Show. Unofficially known as "Season 0," the original 48 ad-bumpers kicked off what is now well established as one of television's all-time classic series (which premiered on the then-fledgling FOX network in December 1989). It reached the thirty season mark in 2018-19, making it the longest-running prime-time sitcom in American TV history (worldwide, that honor belongs to Last of the Summer Wine, although the latter has fewer episodes, with 297 while The Simpsons has made more than twice that), and surpassed Gunsmoke as the longest running scripted television program by episode count ever in 2018.note Unless, as Bart notes in the episode before they broke Gunsmoke's record, one factors in the 432-episode radio adaptation. Depicting the animated adventures of the upper-lower-middle class Simpson family, the show started as a parody of Dom Com conventions, but quickly incorporated elements of social satire, pop culture references, and a mix of highbrow and lowbrow humor that has kept it popular year after year. When it was first adapted into television, it set a new trend in animation - much of the voice acting had been rather industrial, with voice actors simply reciting a list of their character's linesnote As in: "Line 234: "Bart! Why you little..."", in whatever emotion the script called for. The Simpsons, however, recorded its lines like a live-action movie, the voice actors for a given scene recording together, allowing for more organic interaction between the characters. One reason for the show's longevity is the massive cast of over 100 recurring characters it has built up over time, allowing the writers to work with a rich variety of relationships and milieus. Another thing that has established The Simpsons as being unique is an absolute refusal to acknowledge the passing of time. Bart has remained 10 years old and in general the show employs an active Negative Continuity, sometimes even acknowledged in the show. 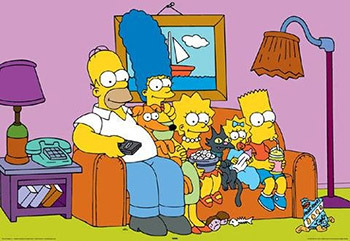 For roughly the first 10 seasons, The Simpsons was widely considered to be one of the most consistently funny TV shows ever produced. However, it is generally considered that at some point after (or near the end of) that, the series declined in quality. Exactly when it declined, and by how much, is difficult to find a consensus on, but viewership has decreased over the years. Its numbers remain strong though, and the merchandising juggernaut shows no signs of stopping. Fox at one point considered setting up a separate Simpsons/spin-off network ; though that didn't happen, Simpsons re-runs became a cornerstone of the comedy-oriented FXX cable network when that was spun off from the FX network. Though, despite claims that it's not as good as it once was, there's something to be said about a show that debuted (as a series of shorts) when Ronald Reagan was U.S. President, debuted in prime-time and referenced by name when George H.W. Bush was in office, had its best years when Bill Clinton was in office, was more-or-less still going strong during the George W. Bush administration, saw Barack Obama get elected twice, and is still around to ridicule Donald Trump's entire campaign and ongoing tenure. A feature film (creatively titled The Simpsons Movie) was released in summer 2007. Perhaps not surprisingly, reactions from fans were mixed, with some fans claiming it to be on the level of the Golden Age episodes, and some considering it just an extra long Tarnished Age episode. Nevertheless, the film was a huge financial success and received a positive response from critics, earning a 89% Fresh Rating on Rotten Tomatoes and getting a 80 on Metacritic. Many of the people behind the show are also responsible for Futurama (and while Futurama certainly takes some comedic cues from this show, it is a far cry from a Simpsons clone). Matt Groening has said he created the core family members in The Tracey Ullman Show's production office waiting room after realizing he didn't want to sign the rights to his Life in Hell characters over to Rupert Murdoch. In 2009, the show began its 21st season, officially dethroning Gunsmoke as the longest running primetime American television series of all time, before surpassing Gunsmoke's episode total in 2018 (although Sesame Street, among other daytime programs, still retains an even longer run with 40 seasons). In February 2019, The Simpsons (in its record 30th season) was renewed by Fox for two more seasons, leading some to speculate the series will end after those seasons as Disney will take control of the series by then. Check out this character sheet for more info on Fox's "first family" of animation. Also has a work-in-progress recap page here. See the Franchise page for all related works.